From Bon Jovi Tribute to the Gobble Jog — Busy Few Days! FRI NOV 22 – SLIPPERY WHEN WET 8:30 PM In 2007 the band was officially authorized by Bon Jovi. Their drive, musical ability, showmanship and dedication to duplicating the Bon Jovi live experience makes this show a must see for any Bon Jovi fan! At the Strand, on the Square, Marietta. Tickets fare on sale now. Tickets are $15. Call the box office at 770-293-0080 or reserve online at www.earlsmithstrand.org. FR-SUN NOV 22-24 GEM, MINERAL AND JEWELRY SHOW, in Marietta, GA. Find amazing rocks, gemstones, minerals and fossils from all over the world! Choose from a large selection of beautiful beads, jewelry and jewelry making supplies. Fun for the whole family, with faceting and jewelry making demonstrations and many interesting displays. Hourly Door Prizes. Free Admission and Free Parking. Cobb County Civic Center, 548 Marietta Parkway, Marietta, GA. Hours: 10am -6pm November 22-23, 10am-5pm November 24. FRI-SUN NOV 22-24 THE TOYMAKER TAKES MANHATTAN Join IMPACT Dance on November 22, 23 or 24 for their brand new production of “The Toymaker Takes Manhattan”, where their very own Toymaker is invited to NYC to guest host the most popular parade in the world. The production is at the Murrary Arts Center at Mt. Paran Christian School. For tickets call 770-974-8653 or purchase at the door. SAT. NOV 23 SWIFT CANTRELL SKATEPARK OPENS. Ribbon Cutting ceremony at 10:00 a.m. Opening Day will be a festive atmosphere. Members of local outfitter Ambush Board Company’s skate team will be on hand as well as Red Bull’s MXT event vehicle. There will be music, merchandise giveaways and raffles along with food vending on-site. A limited edition of Swift-Cantrell Skatepark t-shirts will also be available for purchase. Kennesaw’s Swift-Cantrell Skatepark, located at 3140 Old 41 Highway, is open daily from 7 a.m. to 10 p.m. There is no charge to use the facility. In the case of severe weather, Opening Day will take place on Monday, November 25. 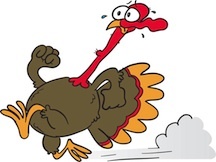 THUS NOV. 28 GOBBLE JOG 10K starts at 8:00 am; 5K starts 9:30 am. On the Square Marietta. For more information or to register: go to www.gobblejog.org , or call the Gobble Jog hotline: 678-218-4521.